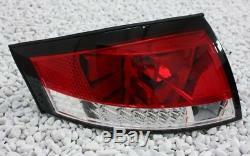 Led crutch tail lights set for audi TT 8n 98-06 convertible coupe red. This product page has been automatically translated. If you have any questions, do not hesitate to contact us. 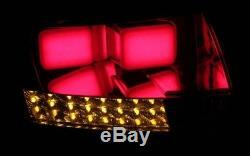 Red / transparent led-bar lights. Connection by specific vehicle form. 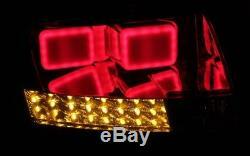 Rear - and brake light function, as well as indicators are carried out by led light. Compatible with on-board computer / lamp control, no error is displayed. The article has an e-mark and so it is in the road traffic without registration. 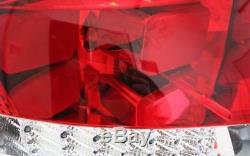 Scope of supply: complete set of taillights (2 pieces), all bulbs. Conclusion of the contract 3. Prices and terms of payment 5. Conformity and legal guarantees 7. Applicable law and jurisdiction 8. Out-of-court settlement of disputes b. Information on the collection of personal data and contact details of the controller 2. Use of your data to send newsletters 4. Processing of personal data in the context of processing orders 5. Rights of the data subject 6. Shelf life of personal data 7. The present GCV cancels all conditions imposed by the customer, unless otherwise agreed. 1.2 within the meaning of these General Terms and Conditions, a consumer is considered to be a natural person who acts for purposes which do not fall within the scope of his commercial, industrial, artisanal or liberal activity. 2.4 the customer has the opportunity to correct the information entered with the usual functions of the keyboard, before placing the firm and final order. In addition, all the information communicated is displayed again in a confirmation window just before the final validation of the order and can be corrected in the same way. 2.5 only the French language is authentic for the conclusion of the contract. 3 right of withdrawal consumer customers have a right of withdrawal. More details on the right of withdrawal can be found in the information of the seller concerning the exercise of the right of withdrawal. They will be, if necessary, expressly posted on the site of the salesman. 4.2 deliveries to countries outside the European Union may incur additional costs borne by the customer and not attributable to the seller. 4.4 If an advance payment is agreed, it must be made immediately after the conclusion of the contract. 5 delivery conditions 5.1 the goods are delivered regularly by post to the delivery address indicated by the customer, unless otherwise agreed. 5.2 If the transport company returns the goods to the seller due to the impossibility of delivering them to the customer, the costs incurred by the failure of the shipment will be attributable to the customer. However, this will not apply if the customer has actually exercised his right of withdrawal, if the customer is not responsible for the circumstances that led to the impossibility of the delivery of the goods, or if it has been provisionally prevented from receiving delivery, unless the seller has notified him in advance of a reasonable delivery period. 5.3 for logistical reasons, a pick-up by the customer is not possible 6 compliance and legal guarantees 6.1 the seller is liable for defects in the conformity of the goods to the contract under the conditions of article l. 217-4 and following of the code of consumption and hidden defects of the thing sold in the conditions provided for in articles 1641 and following of the civil code. 6.2 the consumer has a period of two years from the delivery of the property to act. He may choose between repairing or replacing the goods, subject to the cost conditions provided for in Article l. 217-9 of the code of consumption. It is excused from showing proof of the lack of conformity of the good during the twenty-four months following the delivery of the good, except for second-hand goods. 6.3 the legal guarantee of conformity applies regardless of the commercial guarantee that may be granted. In this case, he has the choice between the resolution of the sale or the reduction of the selling price in accordance with Article 1644 of the Civil Code. 6.5 for possible commercial guarantees, please consult the seller's website. 6.6 if the consumer wishes to make a claim under the legal guarantee of conformity provided for in Articles l. 217-4 and following of the code of consumption or warranty defects of the thing sold within the meaning of articles 1641 and following of the civil code, it can address it to the seller (quantitec gmbh, wodanstraße 18, 13127 berlin, deutschland) 7 Applicable Law and Jurisdiction 7.1 If the customer is a consumer within the meaning of Article 1.2, any legal relationship between the contracting parties shall be governed by the law of the country in which the customer has his habitual residence, excluding commercial law international union. The competent jurisdiction for any dispute in connection with this contract is exclusively that of the habitual residence of the customer. 7.2 If the client is a professional within the meaning of Article 1.2, any legal relationship between the contracting parties shall be governed by the law of the country in which the seller has its registered office, to the exclusion of the United Nations' international trade law. The competent jurisdiction for any dispute in connection with this contract is exclusively that of the seller's registered office. In order to settle disputes with a seller, consumers have the option of using mediation through this European platform. 8.2 In accordance with the provisions of the Consumer Code, an amicable settlement also applies to cross-border consumer disputes. This website provides, in particular, the contact details of the european consumer center france and information on how the consumer can benefit from the out-of-court settlement of such cross-border disputes. If the customer wants to use the mediation service during a dispute with the seller, he must first contact the seller in writing. The mediator's service can only be entered when an agreement with the seller has not been reached. We inform you here about the processing of your personal data when using our website. Personal data is all data with which you can be personally identified. 1.2 the data controller on this website is, as defined by the General Data Protection Regulation (DGPRG), quantitec gmbh, wodanstraße 18, 13127 berlin, deutschland. The person responsible for the processing of personal data is the natural or legal person, the public authority, the service or any other body which, alone or together with others, determines the purposes and means of the processing of personal data The data collected via the contact form can be consulted from this same form. These data are recorded and used for the sole purpose of answering your request and to allow contact and the corresponding technical administration. The data processing is carried out, if necessary, in accordance with the provisions of article 6, paragraph 1, point f rgpd in our legitimate interest to respond to your request. In addition, if your purpose is to enter into a contract, the processing of your data will be carried out on the basis of Article 6 (1) (b). Your data is deleted at the end of the final processing of your application, that is to say when it can be deduced from the circumstances that the situation is definitely clarified and that there is no legal obligation of retention contrary. By subscribing to our newsletter, you give us your consent to the processing of your personal data in accordance with Article 6, paragraph 1 under a rgpd. 4 processing of personal data as part of the processing of orders 4.1 for the processing of your order, we work with the provider (s) mentioned below. These latter support us totally or partially in the execution of the contracts concluded. 4.3 service providers - afterbuy order processing takes place via the "afterbuy" service provider (via online gmbh krefeld). Name, address and, where appropriate, other personal data in accordance with Article 6 (1) lit. B dsgvo exclusively for the purpose of processing the online order transmitted to "afterbuy". The transfer of your data takes place in this case only to the extent that it is really necessary for the processing of the order. The transfer shall be carried out in accordance with Article 6 (1) (b), exclusively as far as necessary for the processing of payments. The credit report may contain probability values ​​(referred to as score values). If score values ​​are included in the result of the credit report, they are based on a scientifically recognized mathematical-statistical procedure. The calculation of score values ​​includes, but is not limited to, mail correspondence data. 5 rights of the data subject 5.1 the applicable data protection regulations grant you rights (rights of information and intervention) vis-à-vis the data controller, which we inform you below: - right to information in accordance with art. Rgpd; - right of rectification in accordance with article 16 of the rgpd; - right of cancellation in accordance with art. 17 rgpd; - right to limitation of treatment in accordance with art. 18 rgpd; - right to information (notification) according to art. 19 rgpd; - right to portability of data in accordance with art. Rgpd; - right to withdraw consent given in accordance with art. 7, paragraph 3 PGCE; - right of complaint under article 77 of the rgpd. 5.2 right of objection If we treat your personal data in the belief that there are legitimate and compelling reasons for your own interests, you may object at any time to such treatment for reasons relating to your particular circumstances. If you exercise this right of opposition, the processing of the data concerned will cease immediately. However, we reserve the right to continue processing if we can prove that the continuation of the treatment is justified by legitimate and imperative reasons that prevail over your interests, rights and freedoms or if the continuation of the treatment allows the recognition, the exercise or the defense of rights in court. When we process your personal data for prospecting purposes, you have the right to object at any time to the processing of your data for such prospecting purposes in the manner described above. If you exercise your right to oppose the processing for prospecting purposes, your data will no longer be processed for these purposes. 6 retention period of personal data the retention period of personal data is determined by the applicable legal retention period (for example, commercial and tax retention periods). After the expiry of these periods, the corresponding data will be systematically and regularly erased, provided that they are no longer necessary for the execution or initiation of the contract and / or that there is no longer any legitimate interest in their preservation. The item "led crutch tail lights set for audi tt 8n 98-06 cabriolet coupe rouge" is on sale since Monday, February 19, 2018. 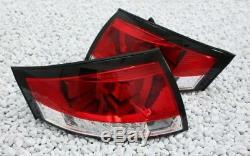 It is in the category "auto, motorcycle parts, accessories \ tuning, styling \ custom lighting \ rear lights". The seller is "fastwienix" and is located in berlin. This item can be delivered anywhere in the world.